It's been a while since I felt moved to write a post on mindful eating, but this week I had a great visit with one of my favorite Sangha's and enjoyed a great reminder of the value of mindful eating WITH people, AS a Sangha (community). As I'm coming up on the end of three years since I discovered "Savor" by Dr. Lilian Cheung and Thich Nhat Hanh, mindful eating is a part of my daily life. I'm far from perfect, and too often find myself wolfing down my lunch because I'm in a rush, or buying a sweet dessert treat when I don't even want one, but these moments are rare indeed, and only ever when I'm not being mindful. All in all, the 110 pounds I lost has stayed off, and the lifestyle (both around food, and my Buddhist path) have stuck. Big time. So I'm very pleased. I eat mindfully daily but, due to the nature of my job and life, I often eat alone. Eating mindfully - WITH - a community of other people also observing mindful eating practice, is something I rarely get the opportunity to do. So, this past week, I found myself once again in the fine company of the Honey Locust Sangha of Omaha, Nebraska. When I visited them about a year or so ago, I was welcomed warmly and made friends with Mike McMahon who leads the group. Mike was very willing and helpful to me with advice on how to run a Sangha, and my own Sangha at that time was probably brand new, or perhaps hadn't fully started up yet. I can't recall. True to his, and the Honey Locust Sangha's, history they welcomed me warmly in to their group. By sheer luck I happened to be working in town the week that they had their teacher, Brother Chan Huy, with them from Canada to lead their annual retreat. The retreat was coming up this weekend (as I write this) and during the week leading up to it they had a public Dharma talk which fell on the night I arrived in town. That Dharma talk was wonderful, and even gave me a really great insight, or better way of understanding, Emptiness. I'll save that, perhaps, for another post as it's not related to mindful eating. Anyhow, on the second night I was in town the Sangha had a Pot Luck Dinner at one member's home. They graciously invited me to join them and I was so deeply honored, I was beside myself. 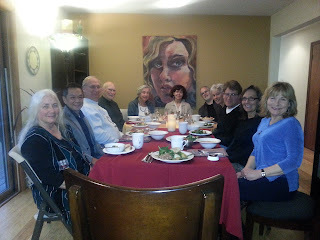 Visiting a Sangha's meditation night is one thing, being invited to their private dinner with their teacher is quite another. It's this very quality that makes them so special and which makes Mike such a good example of how to facilitate a Sangha. I arrived just in time for everyone to plate up and have a seat. They announced that we would have a 10 minute "Noble Silence" period during which we would eat mindfully, then we would go around and share some discussion (we shared stories from a member who had recently visited and worked with an orphanage in India, stories from the travels and teachings of Brother Chan Huy and his trip to Vietnam, and they kindly asked me to share some about my own Sangha). A timer was set, a bell invited to ring, and the mindful eating began. I bowed, and took a moment to breathe in, and out, and check in with my body. I sat at the end of the table, between the fireplace and the door to the outside deck. Each was a few feet to either side of me. A wintry mix had been falling and the deck was rapidly collecting an inch or two. Taking stock of my body, I felt the cool left side in contrast to the toasty, wonderfully-warm, right side near the fire. I felt my feet firmly on the floor. I gained that whole-body-at-once sense that one sometimes gets where I could feel everything all at once. Then I brought my focus to my breathing. I breathed in and out a few times, and raised my fork. All of this had taken place in the space of a few moments, and already the present moment awareness was so clear and intense as to be dazzling. I think I was the only one who brought a dish not home-made, as I was staying in a hotel and had no time or facility for cooking. I brought a pretty nice Tabbouleh from Whole Foods, and it was good, but lacked that home-made-quality that the other dishes had. The other dishes were each amazing! I didn't get to try everything, but I had a spinach salad that was spectacular, some amazing asparagus with roasted potatoes, some sort of delicious tomato soup I think. And several other items. Each of them were wonderful. Even with the concentrated effort at slowing my body and mind down before starting, I found I was eating quickly at first. I slowed more. I took a bite, placed the fork down, chewed mindfully tasting the flavors of each of these dishes. Sometimes I was aware of the overall flavor, at other times I was keenly aware of the flavors individually. I was aware of the textures. I was aware of all of the elements and human effort that was contained within each bite. The ten minutes seemed to last for hours, and I mean that in a good way. Hours of delicious awareness. I was aware of the room. The other practitioners eating at their various rhythms. The sounds in the house. The sounds from outside, though muffled by the slushy mix, were present. My favorite part was the ever present contrast of temperatures between the left and right sides of my body due to my fortunate seat by the fire. There was the low hiss of the fire. The feeling of the fork in my hand and the fabric of my jeans in the absence of the fork, as I placed my hand on my knee. All of this, and much more. And it was beautiful. Over all of that, like the snow covering the deck outside, was a sense of deep gratitude for being invited and welcomed by this lovely Sangha, also a sense of gratitude for this practice that has so altered my life. And, over the top of even those feelings, another feeling that is more difficult to describe. I can only best describe it as a connecting energy of some sort. You often get this feeling when you meditate with a group, I think. I do anyhow. This energy is one of the many reasons, and certainly - in my mind - the primary one, which makes a true live Sangha so valuable. There is a quality to mindfulness as a group of human beings, side by side, that creates a sort of feedback loop. A sort of humanity fueled Tesla Coil, or Resonant Transformer, that electrifies, intensifies and transforms the energy one cultivates on one's own. "Tesla Coil (Resonant Transformer): the near field wireless transmission of electrical energy between two coils that are tuned to resonate at the same frequency. The equipment to do this is sometimes called a resonant or resonance transformer." I think, if you wanted to sound just a little sappy, you could label this poorly with a single word.